The Greek Orthodox Archdiocese of Australia, headquartered in Sydney, is an eparchy of the Church of Constantinople. Its current primate is His Eminence Stylianos (Harkianakis), Archbishop of Australia and Exarch of Oceania. For more detailed history before 1974, See Greek Orthodox Archdiocese of Australia and New Zealand. 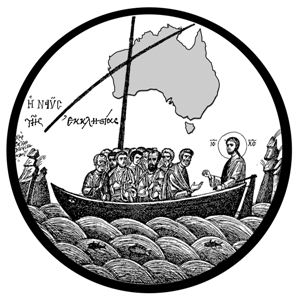 Before 1908, there were two multi-ethnic parishes in Australia, under the omophorion of the Church of Jerusalem; but, in 1908, jurisdiction over Australia was transferred to the newly-recognised Church of Greece. In 1924, the parishes - by now, Greek in character as well as in name - were formed into a metropolis under the Church of Constantinople. In 1959, the Greek Orthodox Metropolis of Australia and New Zealand was elevated to Archdiocese, and Metropolitan Ezekiel elevated to Archbishop with it. In 1970, due to the growing size and needs of the Archdiocese, Australia and New Zealand were split into the Greek Orthodox Archdiocese of Australia and the Greek Orthodox Metropolis of New Zealand. In 1974 Abp Ezekiel was promoted to the Metropolis of Pisidia, and the current Archbishop, Stylianos (Harkianakis), was elected on 13 February 1974 and enthroned on 26 April, 1975. In 1977, Fr Ezekiel was consecrated to the episcopacy, becoming the titular bishop of Dervis. In 1979, the Greek Orthodox Archdiocese of Australia was a founding member of the Standing Conference of Canonical Orthodox Churches in Australia, with its archbishop being made permanent chairman of SCCOCA. In 1982, the Archdiocese founded St Andrew's Greek Orthodox Theological College in Sydney, with Archbishop Stylianos as the first dean. In 1991, Fr Seraphim was consecrated to the episcopacy, as titular bishop of Apollonias. In 2001, Fr Nikandros (Palyvos) was consecrated to the episcopacy, as titular bishop of Dorileou. Archimandrite Iakovos (Tsigounis) was elected to be an auxiliary bishop for the Archdiocese of Australia, with the title of Bishop of Militoupoleos. Bishop Iakovos is the first Australian-born bishop to serve in Australia, and in the Archdiocese, and the first graduate of St Andrew's Theological College to be made a bishop. The Greek Orthodox Archdiocese of Australia is treated as one single archdiocese with five archdiocesan districts: New South Wales and the Australian Capital Territory; Victoria and Tasmania; South Australia and the Northern Territory; Queensland and New Guinea; and Western Australia. To assist the archbishop, he has a number of assistant bishops - currently four - overseeing the !118 parishes, communities and monasteries across Australia. The Archdiocese also includes 6 monasteries. The largest male monastery is the Holy Monastery of Pantanassa on the Central Coast of New South Wales, and the largest female monastery is the Holy Monastery of Gorgoepikoos in Geelong, Victoria. The Archdiocese has numerous successful organisations under its wings. Each of these organisations and schools have been built by donations of the faithful and by contributions by the Australian government. In 1982, the Archdiocese began the St Andrew's Greek Orthodox Theological College in Sydney as a part of the School of Divinity of the University of Sydney. Archbishop Stylianos currently serves as the dean of St. Andrew's, while Bishop Seraphim serves as sub-dean. As the lone Orthodox Theological College in Australasia, it often accepts students of other jurisdictions. The Archdiocese boasts seven bilingual colleges around Australia, including primary and secondary education, offered to both children of the Church and Australians alike. Each school has between 650-1000 students who enjoy education in all disciplines, including Greek language, culture and the Orthodox Christian faith. Byzantine chanting is a key part of liturgical services in the Archdiocese. Two performance choirs have been formed: the Byzantine Ecclesiastical Choir "Saint John of Damascus" in Adelaide under Elias Frangoulis, the Archon Protopsaltis of the Greek Orthodox Archdiocese of Australia; and the Australian Byzantine Choir in Sydney, now under George Combis, which in addition to performing, first provided a place for Sydney's chanters to be taught, and then provided two of the three teachers for the Archdiocesan School of Byzantine Music, established in 2005 under the auspices of Saint Andrew's Greek Orthodox Theological College. Both choirs, and the school, teach and perform Byzantine chanting in Greek. St Andrew's Orthodox Press, established to publish the TO VEMA newspaper , Phronema and The Voice of Orthodoxy, has recently begun publishing books. Publications range from liturgical books (e.g. the Archdiocese's official translation of the Divine Liturgy) to translations and publications by faculty of the Theological College. St. Basil's Homes (Australia), operate around Australia in each capital city since 1969 caring for all needs of the aged in their numorous facilities as well as delivering care into the homes of the Greeks under a variety of community care programs. St. Basil's cares for about 1200 aged Greeks in Australia. In 2006 St. Basil's commissioned a new $34 million state of the art facility in Miranda to the south of Sydney. The Estia Foundation of Australia offers respite to those caring for children and adults with disabilities, and currently cares for over 100 young people. A related organisation, the Provicare Foundation, has its main focus on drug and alcohol prevention, with telephone councelling and client visits. Each parish in the archdiocese hosts any number of the following activities besides their usual worship and pastoral program. These can include: child care centres, Greek language school, companionship groups for the aged, infant play groups, teenagers groups, Bible study, Orthodox lecture series, iconography courses, Byzantine chanting classes, catechism schools, social clubs and meals for the poor. The Greek Welfare Centres, operating for over 35 years under government funding and charity in each capital city and other cities of Australia. The 150 staff of the Greek Welfare Centres around Australia offer a large variety of programs and catering for the enormous varience in the needs of the hundreds of clients that flow throught their offices and their satellite centres each week. Archbishop Stylianos (Harkianakis) of Australia. Bishop Ezekiel of Dervis; responsible for the Second Archdiocesan District of Victoria and Tasmania (46 parishes and communities). Bishop Seraphim of Apollonias; responsible for the First Archdiocesan District of New South Wales and the Australian Capital Territory (38 parishes and communities). Bishop Nikandros of Dorileou; responsible for the Third Archdiocesan District of South Australia and the Northern Territory (16 parishes and communities), and the Fifth Archdiocesan District of Western Australia (6 parishes and communities). Bishop Iakovos of Militoupolis is also responsible for the Second Archdiocesan District (along with Bp Ezekiel). The Fourth Archdiocesan District of Queensland and Papua New Guinea (10 parishes and communities) is cared for by Economos Dimitri Tsakas, the Archepiscopal Vicar for this district. Stylianos (Harkianakis), Archbishop of Australia, 1974-present. Ultima editare a paginii a fost efectuată la 3 decembrie 2018, ora 20:21. Pagina a fost accesată de 360 de ori.